EWA BEACH — Puuloa Range Training Facility hosted 140 competitors in the Pacific Division Rifle Match from Jan. 28 until today. The match is one of four in the Competition in Arms Program, held annually at Marine Corps bases around the world. The top 10 percent of the competitors will have a chance to compete in the Marine Corps Championship Matches. 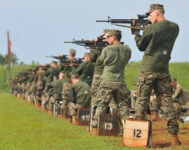 “The Competition in Arms Program enhances the Marine’s critical combat skills for small arms marksmanship,” said Chief Warrant Officer 2 Brian Somers, officer in charge, Range Training Facility Puuloa. Somers said the turnout doubled compared to last year, with representation from all of the base’s tenant units. Of the 140 competitors, 105 are from 3rd Battalion, 3rd Marine Regiment, including the commanding officer, Lt. Col. Jeffrey Holt. Capt. 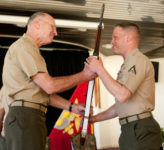 Donald Traves, officer in charge, Marine Corps Rifle and Pistol Team, said that number is “unprecedented.” Traves, also representing the commandant of the Marine Corps at the match to ensure standards, said 21 competitors are officers, which is also a rarity at these matches. “They get to go back and train their enlisted Marines,” Traves said. The three-week competition includes time for shooting practice under instruction from six members of the Marine Corps Shooting Team, from Marine Corps Base Quantico, Va. Marines who compete in the match are able to fulfill their annual rifle and pistol training requirements. For Holt, a “competitive spirit” is part of his command philosophy. The Dallas native said he wanted his Marines to take advantage of the professional marksmanship instruction offered at the matches, but that’s not all. He said the experience has also served as a retention tool. Holt said participating will hopefully encourage them to stay in the Marine Corps for opportunities such as this. Holt said he is happy that this week’s rifle scores have been high, and he hopes the pistol scores will follow suit. He offered his Marines one of his personal challenge coins and a four-day liberty pass if they can beat his score. “I’m proud of them,” Holt said. For some Marines, no incentive was necessary to compete in a shooting match. DiConza, 19, competed in the Pacific Division Match for the first time this year. On the other end of the firing line is competitor Sgt. Monica Preston, musician, U.S. Marine Corps Forces, Pacific Band. Preston, 30, who competed for a second year, said the coaches were very helpful. Out of a maximum of 300 points, Preston’s average score has been 275, and she is confident she can raise it. The top 10 percent of competitors will be awarded marksmanship medals – two gold, five silver and seven bronze medals, which they will be authorized to wear on their uniforms. There will also be one team pistol trophy and one rifle trophy. Combat Logistics Battalion 3 won the Rifle Team Match with a total of 1,111 points, and 3/3 won the Pistol Team Match with a total of 968 points. 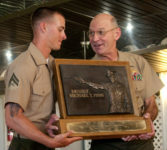 DiConza received a first place gold marksmanship medal in the rifle portion with a final score of 586.39, and was chosen as “high tyro,” which is given to a participant who achieved the highest score and has not competed in a match before. Lance Cpl. 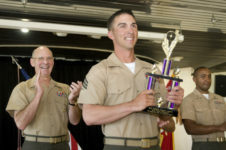 Matthew Lamb, motor vehicle operator, 1st Battalion, 12th Marine Regiment, received a first place gold marksmanship medal, with a final score of 535.13. Fractions in the scores denote how many shots fell within the innermost “X” ring for pistol, or “V” ring for rifles. An awards ceremony will be held at the Koa Malina’s Officers’ Club today. Marines at the Pacific Division Match. Puuloa Range Training Facility, Hawaii. February 2011. Lance Cpl. Antonio Diconza, Weapons Company. Marine Corps Base Hawaii. February 2011. Cpl Andrew Dowers, Kilo Company. Marine Corps Base Hawaii. February 2011. Sgt. Bradley Krejci, India Company. Marine Corps Base Hawaii. February 2011.